Out of Curiosity:: DIY Upholstery? Since I’ve been working on upholstery projects for the last few days, naturally I have upholstery on my mind. If I remember correctly, the very first time I reupholstered a piece of furniture, I was in high school, and my mom and I reupholstered a chair for my bedroom. Upholstery isn’t something I’ve done a lot of, but it’s not something that intimidates me, either. If I have the time, I’ll tackle anything from a wrap-and-staple dining chair seat, to a fully upholstered sofa with a diamond-tufted back. I enjoy the process, and I like figuring out how to put the pieces together, almost like a jigsaw puzzle. For some reason, since I had done tufted headboards before, I didn’t expect the tufting on the chair to be that big of a deal. I figured I’d breeze right through it! There is a huge difference (at least for me) between tufting on very sturdy MDF, and tufting on thin, bendable chip board. It was a very frustrating experience, but it was a great learning experience! So this past weekend, when I upholstered a similar tufted-back chair, the process was much easier. Each thing that I upholster is a learning experience, as no two seem to be exactly alike. But even with the ones that I find incredibly frustrating, I’m always glad I stuck with it, because I just love the feeling of finishing a project and seeing something that I created with my own two hands. So what about you? When it comes to upholstery, are you willing to tackle the project yourself? Does it depend on the complexity of the project? Or are you more than happy to hand off your upholstery projects to a professional? 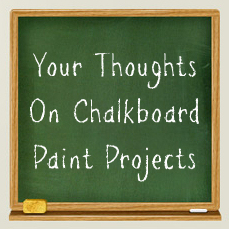 Out Of Curiosity: Are Chalkboard Paint Projects Sooooo Last Year? Out of Curiosity:: Mixing Metal Finishes In A Room? Out of Curiosity:: Home Offices, Good or Bad? I am so tempted to reupholster my grandmother's 1950 glider chair. Right now it's sitting in my bedroom and I use it for studying, but the material is way outdated. It's actually a big chair that need a larger living room, but I figure one of these days we'll buy a larger home (I'm crossing my fingers). Have you thought of posting a how-to video? I'd love to know how you get the tufting to look so even and plush. That's so funny, Angela, because I'm just the opposite. I'll tear into any piece of furniture and reupholster it, but I'm terrified of slipcovers. The art of upholstering? lol…I'm honored that you think I'm qualified to teach such a thing! 😀 The truth is, I'm just a DIYer who muddles through. A real upholsterer would cringe at my "techniques". But I'll see what I can do. I would love to redo one of my newest chairs they are the same lovely gold color you had.. err… but I do not want to screw up a chair that looks like it cost more than my car. lol joking. but you get my point! I found almost the exact same chair in a thrift store for $12. Here's the "after" picture. Very proud of my first upholstering project. Thank you so much for posting this! I have an old chair I have been hanging on to for years, but I hate the fabric. Now I feel I can do it!! Thank you for posting this. I have a chair that I bought for $15.00 and it needs some love. I took it to see how much it wold cost for a pro to do and I was totally blown away at how much she wanted. Almost $500.00. My husband and I are going to give my find a new look. I hope it turns out as well as your. I’m in process of finishing an upholstery project of my sofa and loveseat. I’m blessed to have my mother help me. I learned so much that I can now do them my self. Its the 2nd time we reupholstered them! It sure does save money, rather than to buy a new set. Also they are both hidabeds for guests. The sofa is orange and the loveseat is cream colored. Both fabrics had a nap to them. It was an interestingchallenge to get it right. Will send pics when finished. My brother is actually good at upholstery! I am now trying to convince him to teach me but I am having a hard time with the staple gun. Hi, I’m totally intimidated by upholstery. So clearly the logical thing to do was tackle a headboard first. I’ve seen you use two methods to do the tufts: one with a drill, one with a needle and waxed thread. From your pictures both look amazing. Do you find the one looks better or lasts better? Thank you for your wonderful tutorials!! I don’t find that one is better than the other as far as the finished result goes. I do find that the screw and washer method is only appropriate for heavy fabrics, like woven upholstery fabric or thick cotton or something like that. If you want to use a thinner fabric, the needle and thread method is the only way to go. But both give a beautiful result, and will last a very long time.